Recently, I realized that the vast majority of memoirs I read are by celebrities (medical memoirs come in second). Which isn’t a bad thing – it’s something I really enjoy. They’re usually a great combination of both deep and funny. However, I did want to explore a memoir by someone I hadn’t already heard of. 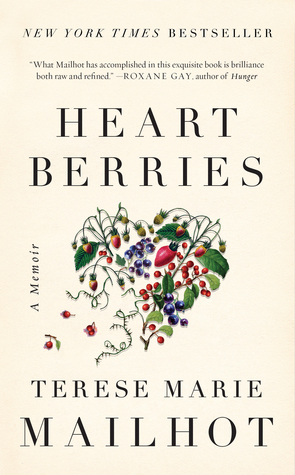 I decided to go with Heart Berries by Terese Marie Mailhot, which I’d previously heard of as one of Emma Watson’s picks for Our Shared Shelf. (From Goodreads) Heart Berries is a powerful, poetic memoir of a woman’s coming of age on the Seabird Island Indian Reservation in the Pacific Northwest. Having survived a profoundly dysfunctional upbringing only to find herself hospitalized and facing a dual diagnosis of post traumatic stress disorder and bipolar II disorder; Terese Marie Mailhot is given a notebook and begins to write her way out of trauma. The triumphant result is Heart Berries, a memorial for Mailhot’s mother, a social worker and activist who had a thing for prisoners; a story of reconciliation with her father―an abusive drunk and a brilliant artist―who was murdered under mysterious circumstances; and an elegy on how difficult it is to love someone while dragging the long shadows of shame. I was immediately blown away by the writing in this book. It’s just so beautiful, and it sucked me into a story that was completely heartbreaking. Mailhot writes in a way that is incredibly personal, but also feels truly special. I can’t talk enough about how amazing the writing is in this book. I want more books like this. I also thought Mailhot did a great job in telling her story. She really lays everything out in this memoir. Her story feels so raw, since it’s told as a letter she is writing from inside of a mental institution. It made me feel like I was there with her, and it hurt. She addresses mental illness in a way that is completely identifiable, but also the ways in which it impacts all the relationships in her life – her son, her mother, and her boyfriends. Beyond that, she looks at how her Native American culture and beliefs play into her mental state, and how they can help heal her. I wouldn’t really call this a coming of age story, because I tend to think of those as something with teenage characters, and Mailhot is a bit older when this story begins. However, it is a story of her learning more about herself, and accepting herself, and I definitely felt that. I don’t have bipolar disorder, nor have I gone through most of what she went through, but I did come to terms with myself and a lot of the struggles of my childhood when I was in my late twenties, so I felt like I could identify with Mailhot’s story in that way. We all go through different things, and it does help to see what other people go through. ★★★★☆ – I really enjoyed Heart Berries. It was a really beautiful memoir that packs a huge impact. The only reason this didn’t get five stars from me is because I found it kind of a struggle to pick it back up each time I put it down. To be fair, it’s not exactly a fun story. But once I got used to how impressive the writing was, the story itself just felt slow and a little bit repetitive. However, it was very stream of consciousness, so that’s just how this book is. I’d definitely recommend it if you’re looking for a book that deals heavily with mental illness. Heart Berries available in bookstores now! You can pick up a copy on Amazon. To get the audiobook for free, use this link to sign up for a free trial of Audible and choose Heart Berries as one of your two free books. Heart Berries does sound heart-wrenching and intriguing! I think I’ll give it a try later on, especially since I’ve realised that the majority of memoirs I read are by celebrities as well, so it’d be nice to see a change of perspective. Great review! I think that’s fair about it being slow and repetitive, but it does sound beautiful and worthwhile overall. Great review! Thank you! Definitely worthwhile! There was just something that prevented it from being a favorite, but it was still a beautiful book.